Nicolás Hernán Gonzalo Otamendi (Spanish pronunciation: [nikoˈlas otaˈmendi]; born 12 February 1988) is an Argentine professional footballer who plays as a centre back for Premier League club Manchester City and the Argentine national team. Born in Buenos Aires, Otamendi made his Primera División debut for Club Atlético Vélez Sarsfield on 10 May 2008, in a 2–1 home win against Rosario Central for the Clausura tournament. During manager Hugo Tocalli's spell he was only fifth-choice stopper, behind Waldo Ponce, Fernando Tobio, Marco Torsiglieri and Mariano Uglessich. However, his role in the first team changed during Ricardo Gareca's first season as head coach, the 2009 Clausura: he replaced Ponce for the third game after the Chilean was injured while playing for his national team, and eventually won a starting position alongside Sebastián Domínguez, playing 17 of the 19 games in Vélez's winning campaign. Otamendi scored his first professional goal during the 2009 Apertura, in a 3–1 victory over Arsenal de Sarandí. During that season he also made his debuts in an international club competition, appearing in the Copa Sudamericana; in recognition of his performances throughout the year he was chosen for the South American Team of the Year, in a traditional continent-wide journalists' poll conducted by the newspaper El País. On 23 August 2010, Otamendi was transferred to Portuguese side FC Porto on a €4 million fee, signing a five-year contract. Vélez also retained 50% of his registration rights, with the player having a pre-set price of another €4 million to be met by Porto prior to September 2011. He netted in his first match, a 2–0 home victory over S.C. Olhanense, finishing his first season with 15 appearances and five goals (notably both in a 2–0 away win against S.C. Braga) as the northerners won the Primeira Liga championship. On 6 September 2011, Porto exercised the rights to sign the remainder of Otamendi's playing rights. He played 30 official games during the season to help the club to another two major titles, notably the back-to-back domestic league. On 5 February 2014, Otamendi was sold to Valencia CF in La Liga for €12 million, on a five-year contract starting on 1 July. He was immediately loaned to Clube Atlético Mineiro in Brazil, and played 19 times for the team from Belo Horizonte, scoring once to open a 4–1 win at city rivals América Futebol Clube (MG) on 23 March in the first leg of the semi-finals of the state championship. Otamendi made his debut in the Spanish top level on 23 August 2014, starting in a 1–1 away draw against Sevilla FC. He scored his first goal for his new club on 4 October, helping to a 3–1 home success over Atlético Madrid. On 4 January 2015, Otamendi headed Valencia's winner in a 2–1 home win over Real Madrid, ending their opponents' club record 22-match winning streak as a result. After helping Los Che qualify for the UEFA Champions League for the first time in four years, becoming the first club stopper to score six goals in the league in the process, he was the only player from his team to be named in the La Liga Team of the Year. Late into the 2015 pre-season, Otamendi refused to train or play with Valencia to avoid thwarting his chances of signing with another club. On 20 August, he joined Manchester City on a five-year deal for an initial fee of £28.5 million. He made his debut on 15 September, coming on as a 75th-minute substitute for Vincent Kompany in a 1–2 home loss against Juventus F.C. for the Champions League group phase; his Premier League debut came four days later, in a 1–2 defeat to West Ham United at the City of Manchester Stadium. On 31 October 2015, Otamendi scored his first goal for the club in a 2–1 home win over Norwich City. He played the full 120 minutes as they won the Football League Cup on 28 February 2016, defeating Liverpool on a penalty shootout in the final. In April 2009, Otamendi was called up by Argentine national team coach Diego Maradona for a friendly with Panama. At the time of his selection he had only played 11 professional games, and eventually started the match on 20 May, in a 3–1 win. During the 2010 FIFA World Cup qualifying campaign, Otamendi played as a centre back alongside Martín Demichelis against Ecuador (0–2 away loss), partnered former Vélez teammate Domínguez against Brazil in a 1–3 home defeat and appeared as a right back in a 1–0 win in Uruguay which sealed the country's qualification to South Africa. On 19 May 2010 he was confirmed as part of the 23-men squad for the final stages, featuring in the starting eleven for the final group stage game against Greece; on the press conference after the match, Maradona said that, in his opinion, he was the best player on the field. Otamendi also played the 90 minutes of the round-of-16 game against Mexico, which Argentina won by 3–1. His final appearance in the tournament was the 0–4 quarter-final loss to Germany: this time his performance received criticism by the football press, as did his manager's decision to improvise him on the right-back position; however, the player subsequently stated his desire to always play for his national team, even if not in his natural position. 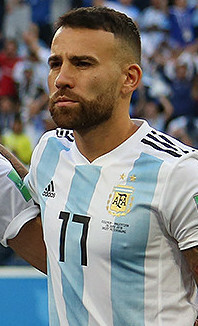 Otamendi scored his first goal for Argentina on 2 September 2011, in a 1–0 friendly win over Venezuela in Kolkata, after heading a corner taken by Lionel Messi. After being cut from the squad that later appeared at the 2014 World Cup, he was selected by coach Gerardo Martino for the 2015 Copa América, playing the entirety of all but one match as they lost to hosts Chile on a penalty shootout in the final; he was named in the Team of the Tournament. Otamendi started all the games in the Copa América Centenario in the United States, in which Argentina again both faced Chile in the tournament final and lost in a penalty shootout, 2–4. In the second group match against Panama, on 10 June 2016, he scored the opening goal in a 5–0 win. Otamendi was included in the squad for the 2018 World Cup. ^ "List of players under written contract registered between 01/08/2015 and 31/08/2015" (PDF). The Football Association. p. 9. Retrieved 12 February 2018. ^ a b c "Nicolás Otamendi: Overview". Premier League. Archived from the original on 7 January 2019. Retrieved 7 January 2019. ^ "European Champions League: Man City: Nicolás Otamendi". UEFA. Archived from the original on 7 January 2019. Retrieved 7 January 2019. ^ a b c d "Nicolás Otamendi: "El de Vélez es un grupo con hambre"" [Nicolás Otamendi: "Vélez is a hungry group"]. La Nación (in Spanish). 28 April 2009. Retrieved 2 October 2009. ^ "Closing '09 statistics". Argentine Soccer. Retrieved 8 August 2010. ^ a b "Verón fue elegido como el mejor jugador de América" [Verón chosen best player in America] (in Spanish). 24CON. 31 December 2009. Retrieved 31 December 2009. ^ "Porto sign Argentina defender Otamendi". UEFA. 23 August 2010. Retrieved 25 August 2010. ^ "Acordo de princípio para a compra do jogador Otamendi" [Negotiations for acquisition of player Otamendi] (PDF) (in Portuguese). FC Porto. 23 August 2010. Archived from the original (PDF) on 30 September 2011. Retrieved 29 August 2010. ^ "Can anybody stop this Dragon?". PortuGOAL. 26 September 2010. Retrieved 9 November 2012. ^ "No let-up from FC Porto and Benfica". PortuGOAL. 14 February 2011. Retrieved 9 November 2012. ^ "Porto finalise Otamendi purchase". FIFA. 6 September 2011. Retrieved 9 November 2012. ^ "Comunicado" [Announcement] (PDF) (in Portuguese). FC Porto. 6 September 2011. Retrieved 20 September 2011. ^ "Valencia confirm signing of Nicolás Otamendi". Inside Spanish Football. 5 February 2014. Archived from the original on 6 February 2014. Retrieved 6 February 2014. ^ "Nicolas Otamendi jugará en Atlético Mineiro cedido por el Valencia" [Nicolas Otamendi will play in Atlético Mineiro loaned by Valencia] (in Spanish). Goal. 7 February 2014. Retrieved 14 February 2014. ^ "Atlético goleia o América e larga na frente na semifinal do Mineiro" [Atlético thrash América and lead the Mineiro semi-final] (in Portuguese). Atlético Mineiro. 23 March 2014. Retrieved 13 June 2016. ^ "Nicolás Otamendi". Valencia CF. Archived from the original on 21 March 2015. Retrieved 20 June 2015. ^ Campos, Tomás (23 August 2014). "Punto de fe del Valencia" [Valencia point of faith]. Marca (in Spanish). Retrieved 3 September 2014. ^ Bengoa, Javier (4 October 2014). "El Valencia derroca al campeón de Liga" [Valencia knock League champions out]. Super Deporte (in Spanish). Retrieved 4 October 2014. ^ Gimeno, Manu (23 May 2015). "Histórico 'Otakaiser': primer central che que marca seis goles en Liga" [Historical 'Otakaiser': first che stopper who scores six goals in League] (in Spanish). El Desmarque. Retrieved 8 September 2015. ^ Skinner, Adam (17 June 2015). "Cristiano Ronaldo and Lionel Messi lead La Liga team of the year... but there's no place for Gareth Bale after disappointing season". Daily Mail. Retrieved 24 June 2015. ^ "Otamendi se niega a jugar con el Valencia" [Otamendi refuses to play with Valencia]. Mundo Deportivo (in Spanish). 15 August 2015. Retrieved 8 September 2015. ^ "Nicolas Otamendi joins City". Manchester City F.C. 20 August 2015. Retrieved 20 August 2015. ^ "Morata earns Juventus victory at Manchester City". UEFA.com. 15 September 2015. Retrieved 15 September 2015. ^ Jurejko, Jonathan (19 September 2015). "Manchester City 1–2 West Ham United". BBC Sport. Retrieved 1 November 2015. ^ Osborne, Chris (31 October 2015). "Manchester City 2–1 Norwich City". BBC Sport. Retrieved 1 November 2015. ^ McNulty, Phil (28 February 2016). "Liverpool 1–1 Manchester City". BBC Sport. Retrieved 13 June 2016. ^ Sottile, Marcelo (17 April 2009). "Bocación local" [Local bocation]. Olé (in Spanish). Retrieved 2 October 2009. ^ "Con destellos, la Argentina venció a Panamá 3 a 1" [With flashes, Argentina beat Panama 3 to 1]. La Nación (in Spanish). 20 May 2009. Retrieved 24 November 2018. ^ "Maradona probó con Otamendi como lateral" [Maradona tested Otamendi as fullback] (in Spanish). La Capital MdP. 11 October 2009. Retrieved 8 September 2015. ^ "¡Acá están, estos son!" [These are the guys!]. Olé (in Spanish). 19 May 2010. Retrieved 19 May 2010. ^ "Liniers queda en Sudáfrica" [Liniers stays in South Africa]. Olé (in Spanish). 23 June 2010. Retrieved 23 June 2010. ^ Edwards, Daniel (4 July 2010). "World Cup 2010 Comment: Javier Zanetti or Nicolas Otamendi? The decision to snub Inter's captain cost Maradona & Argentina". Goal. Retrieved 16 July 2010. ^ Ladyman, Ian (5 July 2010). "Diego Maradona finally exposed as Argentina's weakest link... along with their right full back". Daily Mail. Retrieved 16 July 2010. ^ "Quiero jugar siempre aunque no sea en mi puesto" [I want to play always even if it's out of position]. Olé (in Spanish). 16 July 2010. Retrieved 16 July 2010. ^ "La Argentina de Sabella comienza con victoria ante Venezuela en Calcuta" [Sabella's Argentina start with win against Venezuela in Kolkata]. El Comercio (in Spanish). 2 September 2011. Retrieved 1 February 2014. ^ "Otamendi making the most of every opportunity". FIFA. 3 December 2014. Retrieved 14 June 2015. ^ "Gerardo Martino confirmó la lista de 23 convocados y mantuvo a Casco para la Copa América" [Gerardo Martino confirmed list of 23 selected and kept Casco for the Copa América]. La Nación (in Spanish). 27 May 2015. Retrieved 27 May 2015. ^ a b "Copa América 2015 – Team of the tournament". CONMEBOL. 5 July 2015. Archived from the original on 7 July 2015. Retrieved 5 July 2015. ^ Timms, Aaron (27 June 2016). "Chile win Copa América once again as Argentina title drought continues". The Guardian. Retrieved 27 June 2016. ^ "World Cup 2018: Messi and Aguero in Argentina squad but Icardi out". BBC Sport. 21 May 2018. Retrieved 23 May 2018. ^ "Nicolás Otamendi: Club matches". worldfootball.net. HeimSpiel Medien. Retrieved 25 November 2018. ^ a b c d e f g h i j k l "N. Otamendi". Soccerway. Perform Group. Retrieved 12 August 2018. ^ "Games played by Nicolás Otamendi in 2015/2016". Soccerbase. Centurycomm. Retrieved 27 January 2019. ^ "Games played by Nicolás Otamendi in 2016/2017". Soccerbase. Centurycomm. Retrieved 11 February 2018. ^ "Games played by Nicolás Otamendi in 2017/2018". Soccerbase. Centurycomm. Retrieved 12 August 2018. ^ "Games played by Nicolás Otamendi in 2018/2019". Soccerbase. Centurycomm. Retrieved 27 January 2019. ^ a b "Nicolás Otamendi". National Football Teams. Benjamin Strack-Zimmerman. Retrieved 25 November 2018. ^ McNulty, Phil (28 February 2016). "Liverpool 1–1 Manchester City". BBC Sport. Retrieved 22 April 2019. ^ McNulty, Phil (25 February 2018). "Arsenal 0–3 Manchester City". BBC Sport. Retrieved 25 February 2018. ^ McNulty, Phil (24 February 2019). "Chelsea 0–0 Manchester City". BBC Sport. Retrieved 24 February 2019. ^ "Awards". Copa América 2016. Archived from the original on 27 June 2016. Retrieved 29 January 2018. ^ "Manchester City players dominate PFA team of the year". BBC Sport. 18 April 2018. Retrieved 19 April 2018. This page is based on the Wikipedia article Nicolás Otamendi; it is used under the Creative Commons Attribution-ShareAlike 3.0 Unported License (CC-BY-SA). You may redistribute it, verbatim or modified, providing that you comply with the terms of the CC-BY-SA.